Santa Monica, West Hollywood, L.A.: bike shares are happening in all these cities, and it feels like a trio of no-brainers. But before Los Angeles has even gotten its own bike rental system going, the city of Beverly Hills beat them to the punch. 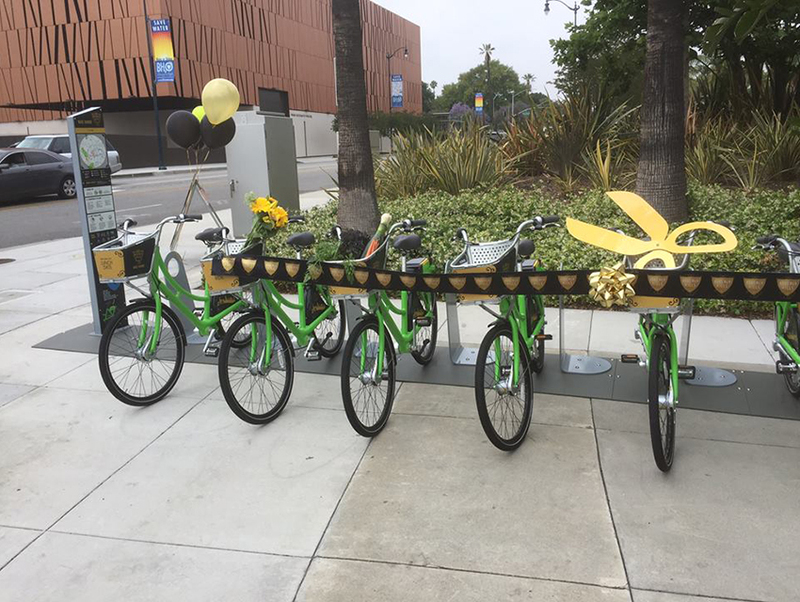 90210—known more for trying to stymie public transportation and resisting bike lanes (more on that later)—cut the ribbon on its own bike share this month. Operated by CycleHop, BH’s modest share starts with 10 stations and 50 bikes; most are near the civic center and tourist district. Cyclists can get a bike at the kiosks or download an app and reserve them. Prices are reasonable: $6 an hour, $25 a month, or $99 a year. We applaud Beverly Hills for taking a pedal in the right direction, but as LAist points out, there is some undeniable irony here. The city council torpedoed bike lanes for Santa Monica Boulevard last year, even though it wouldn’t require taking a lane away from cars. Anyone who knows L.A. realizes Wilshire Boulevard is a nightmare for cycling, so BH is encouraging folks (likely tourists) to rent bikes and ride them on streets that are hostile, if not downright dangerous, to two wheels. Try again, BH.